This bubbly translucent piggy is a great tool to educate the kids how to save money for the future use. The custom classic piggy bank helps them to develop the ideas of saving, investing and donating. Since transparent, the child can see how the money gets accumulated in this. 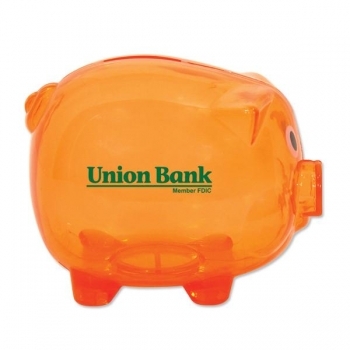 The promotional classic piggy bank offers enough space to imprint your brand name and logo. These are ideal gifts to promote your business through schools or kids shops. The personalized classic piggy banks are great ways for promoting banking, financial investment businesses or kid’s apparels and accessories. The CPSIA approved toy is ideal to promote your brand name through schools.